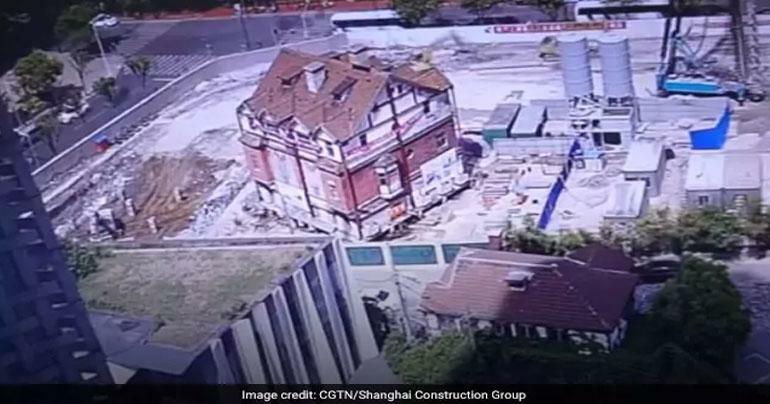 A nearly century-old building was moved 54 metres and rotated nearly 90 degrees in China. The building in Shanghai's Hongkou district was moved to make room for the construction of a new office complex, reports China Daily. Time-lapse footage uploaded on YouTube by CGTN shows the building being moved carefully on specially-designed rails. The relocation of the building - believed to be built 98 years ago - began on April 13 and ended on June 1. Before that, though, parts of the three-storey heritage home were reinforced to ensure it survived the relocation. CGTN reports the building was eventually moved 54.322 metres in total and rotated 89.6 degrees clockwise. The team at Shanghai Construction Group revealed the building was moved by computer-controlled hydraulic machines along a guide rail. "The historical building had to be moved in several phases, because the work space was very constricted," Shen Wei, the project manager with Shanghai Construction Group told China Daily. "It had to be rotated to make sure the facade - the most beautiful side - was facing the public." Last year, a 2,000-tonne Buddhist temple hall in central Shanghai was moved 30 metres to ease crowding. LankaDeepa tells about immersive travel stories to curious, passionate readers who want to learn about the Sri Lanka as much as they want to travel there. Also we provide a global news, healthy information’s and entertainments. We are fuelled by a global community of editors and writers who provide a trusted perspective on the world around us. We are independent, impartial and honest.